Former Scientology executive Marty Rathbun made another leak of formerly secret, internal Scientology documents today, and this time he claims to have uncovered that a Huffington Post blogger who defends minority religions, and Scientology, has been on the church's payroll. That accusation has been made previously about Joseph K. Grieboski, who blogs at Huffington Post's Religion section and runs something he calls the Institute on Religion and Foreign Policy. In 2009, former Scientologist Gerry Armstrong accused Grieboski of taking money from Scientology, claiming that he'd talked to a former Institute employee who told him of the connection. And now Rathbun comes forward with a document from Scientology's Office of Special Affairs -- the church's intelligence and covert operations wing -- which suggests that Grieboski was employed to actively temper anti-Scientology sentiment in European countries. Previously, we've authenticated Rathbun's leaks of OSA documents, including spying operations against Marc Headley, Mark Ebner, and South Park creators Trey Parker and Matt Stone. And besides, another former top Scientology official tells the Voice that he has personal information about Grieboski's employment with the church. I've e-mailed Grieboski at his consulting business and I left a phone message at the Institute, and I'm hoping to get him on the phone soon to discuss Rathbun's OSA document. I've also been in touch with the Huffington Post, and I'm helping their media relations team understand the background on this somewhat complex story. They have been very helpful, and I'm hoping to get a statement from them at any time. What I do know is that Grieboski is not a "featured" writer at HuffPo's Religion section, and his posts don't seem to generate a large amount of comments. "No democracy would admit to being intolerant of minority faiths or opposed to religious liberty. The tactic used to discriminate against targeted minority faiths in some countries is to redefine the notion of 'religion' to exclude disfavored minority groups by labeling them as so-called 'cults' or 'sects.' This is the tactic embraced by the Task Force in the Report," Grieboski wrote. Grieboski didn't mention Scientology by name, but he did lambaste claims that groups use "mental manipulation." Grieboski's use of the Huffington Post to go after something so apparently obscure -- a government task force report in Israel -- did make me curious. So I looked around and found Gerry Armstrong's 2009 open letter to Grieboski. 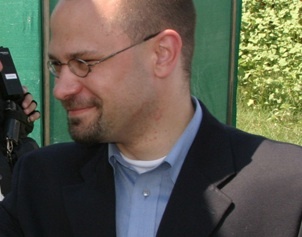 Armstrong, who suffered almost unbelievable harassment at the hands of Scientology's legal corps (overseen, ironically enough, by Rathbun), claimed that he had talked to a man who had worked as Grieboski's former public relations man, and who confirmed to Armstrong that Grieboski (or his Institute) was receiving substantial Scientology payments. I tried to contact the PR man, but he didn't return my call. That reference to Scientology, Rathbun says, convinced him to search through OSA documents in his possession, leading to his discovery of the "Grieboski Program" memo. Joe Grieboski (JG) operates the Institute on Religion and Public Policy, an identity he uses to ally individuals in the RCC [Roman Catholic Church] and other major religions as well as political personalities. He contributed in this manner to the handling of several situations in Europe. However, he is not being run for product to ensure viability and bean return for what he is being paid. He is on a flat rate that is being changed to payment on a "by product" basis. This program lays out needed production that he can generate in exchange for funding from the Church. It must become clear to him that if he does not get products, he will not get any more funds from us. PURPOSE To protect and advance religious freedom interests of Scientology where threatened or blocked. Specific goals are laid out for Scientology's trouble spots: Belgium, France, Germany, Poland, and "Muslim Nations." It's important when looking at OSA documents to keep in mind, however, that these detailed reports are written by OSA operatives trying to please bosses with their industry. So although this report lays out a myriad of things Grieboski will be asked to do, little of the agenda might have actually been accomplished. What the document is unequivocal about, however is that Grieboski had been, at least at that point in 2007, a paid agent for the church. I just talked to Mike Rinder, formerly Scientology's top spokesman and the executive director of OSA until he left the church in 2007. I asked him whether Grieboski really was on the church's payroll. "Yeah. I hired him," Rinder told me. "He was absolutely employed by the church, and it was because of his Catholic connections," Rinder continued. "He had connection into the Vatican, and all of the Catholic countries where the church was having problems. Italy, France, Belgium. That's why he was on the payroll. He's a lobbyist. That's what the guy is." Rinder had to go into a business meeting, but he promises to call back soon with more detail about Grieboski's history with Scientology. We've been unable to reach Grieboski himself., but we at least know something about his day. According to his Twitter feed, this morning he took part in a meeting "on issues in Japan, Korea, Philippines, Malaysia, and Indonesia." And he had lunch at Gadsby's Tavern. We'll keep trying to reach him. 2nd Update: The sharp researchers over at WhyWeProtest.net are on the case. They've pulled up a 2006 tax filing for Grieboski's Insititute that lists several Scientologists on its board of directors, including Monique Yingling, one of Scientology's most prominent attorneys. I'm sorry I wasn't able to get back to you earlier; as you can imagine, things get busy around the holidays. Further, THE INSTITUTE's programs have never been focused on any particular religious community. In fact, THE INSTITUTE has labored on behalf of the rights of countless religious organizations around the globe - from Baha'is in Iran and Ahmadiyyas in Pakistan, Catholics in Saudi Arabia and the Salvation Army in Russia, Falun Gong in China to Evangelicals in Algeria, Serbs in Kosovo to Muslims in Latin America. THE INSTITUTE's track record on advancing freedom of religion and belief for all believers and non-believers is well-documented and well-respected. In a personal capacity aside from my work with THE INSTITUTE, I have advised a number of institutions - religious and non-religious - on policy issues. I have advised the Scientologists as I have numerous other groups. I appreciate Grieboski getting back to me. But he didn't really address the central question of this story. Which is this: as a blogger writing for Huffington Post about religion, shouldn't he disclose that he's taking money from those religions? I've asked him that in a followup e-mail, and I'll provide his response here if he sends one.